In some respects, Facebook’s Graph Search has literally changed the game when it comes to diversity and inclusion with regard to sourcing. If you don’t already have access to Graph Search, you may not be aware just how easy it is to leverage diversity criteria such as gender, race and ethnicity. Imagine being asked to find and identify as many female _______________ (accountants, project managers, software engineers, etc.) who currently work at a particular company or any company. Without Graph Search, how would you go about accomplishing this goal? It’s no easy task. I know several people who’ve worked at some of the top software companies in the world who have had to do some crazy search gymnastics in the past in order to even somewhat successfully identify a small portion of female software engineers at target companies in order to diversify their software development talent. 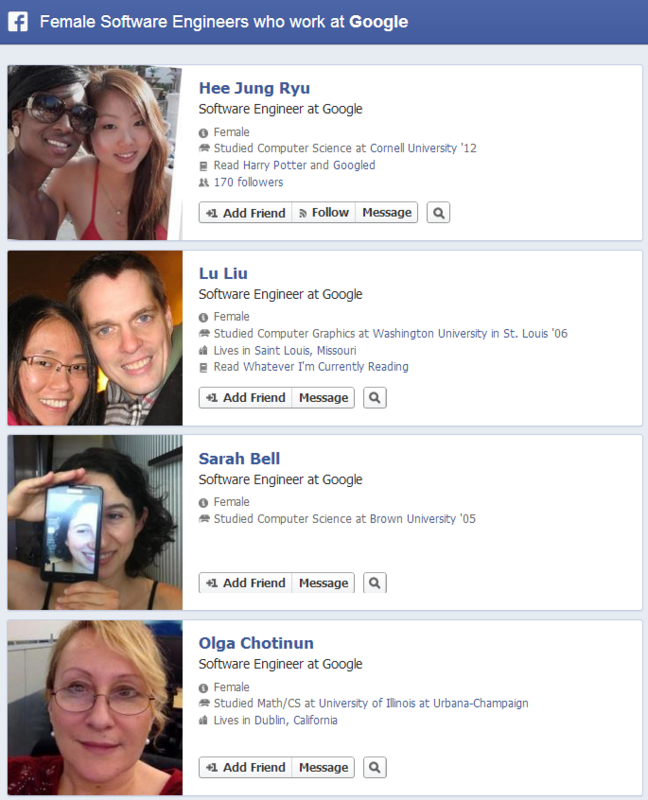 With Graph Search, it’s now simply a matter of asking Facebook for all of the female software engineers or any role you’re targeting at any company. 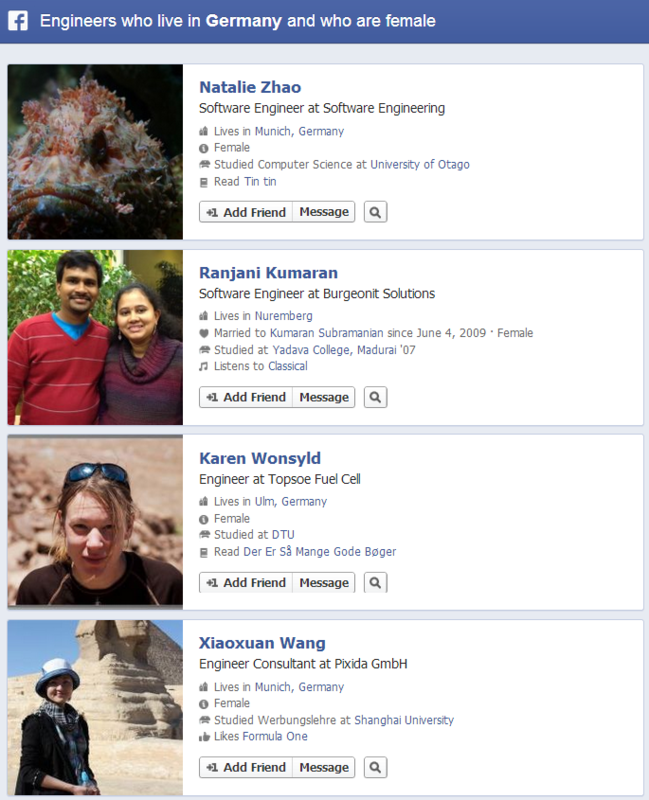 As you can see, sourcing for gender diversity is so easy that Facebook’s Graph Search has essentially rendered it a non-issue, at least when it comes to searching for people by title and/or company. I have to imagine that this has already been done by sourcers and recruiters at Facebook, Microsoft, LinkedIn, etc. Not that it wouldn’t, but this approach also works just as well if you were looking for female engineers in Germany, or any position in any country. While gender search is as simple as selecting gender or asking for it in your Graph Search query, searching by other diversity criteria isn’t as easy, but still not difficult. Let’s say you wanted to find African American electrical engineers. Regardless of where you are searching, you have to think of what things you could potentially search for that could possibly lead you to your desired results. 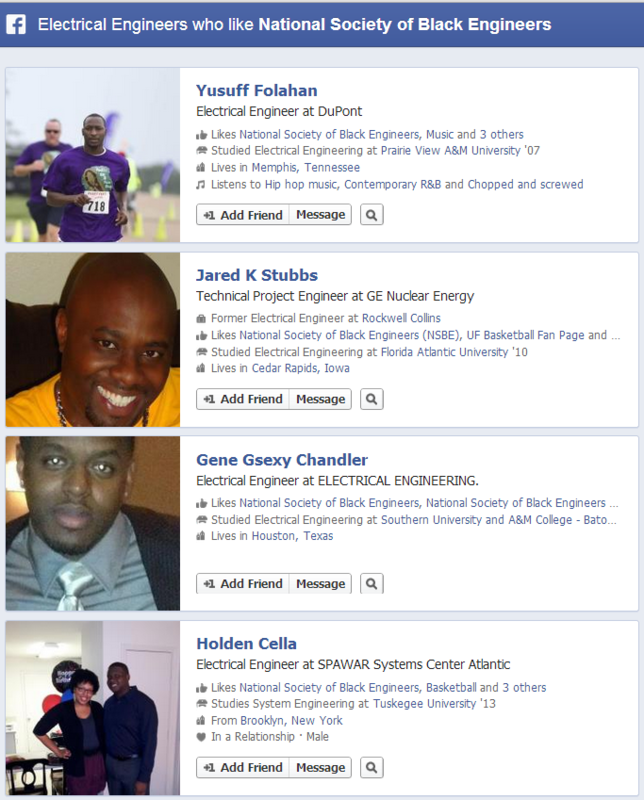 On Facebook, you could search for electrical engineers who “like” the National Society of Black Engineers. You could also search for people who graduated from an Historically Black College or University, such as North Carolina A&T State University. 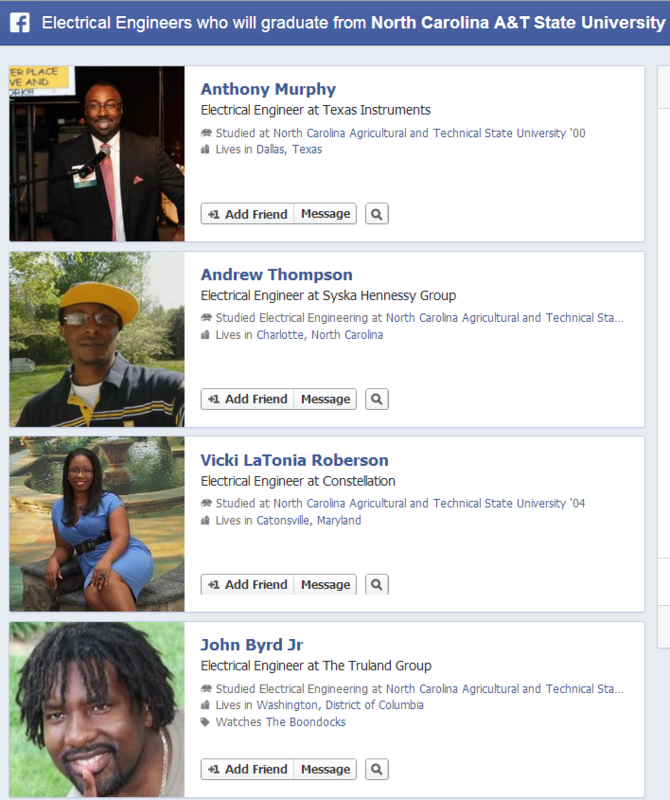 While that was effective, this is where Facebook’s Graph Search is quite limited compared to LinkedIn, because with LinkedIn, you can search across all 100+ HBCU’s with a single search, whereas with Facebook, you are limited to searching one institution at a time because Graph Search doesn’t support basic Boolean OR queries. Bear in mind that what I’ve shown you above is only the tip of the iceberg with regard to the possibilities Facebook’s Graph Search affords diversity and inclusion sourcing and recruiting initiatives. Here’s yet another angle – can you tell what I searched for? 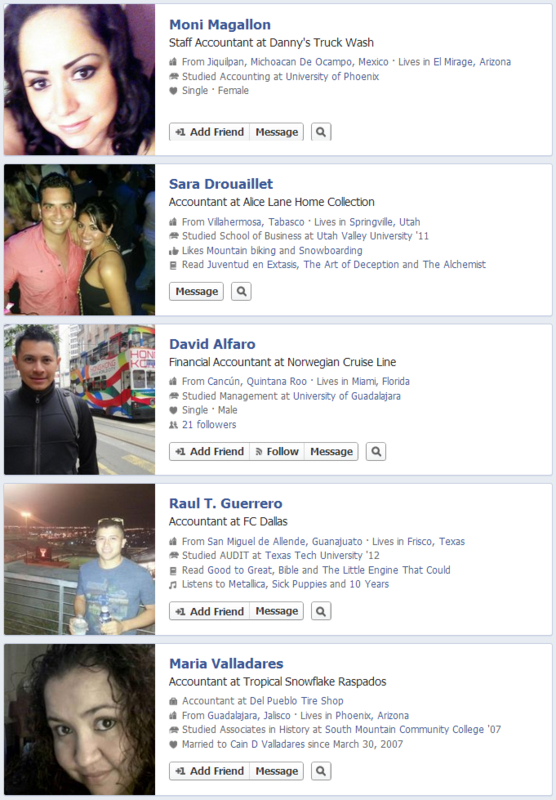 Facebook has about 163 million users in the United States. Using 2011 United States Census Bureau data, I estimate that Facebook represents approximately 63.5% of the U.S. population aged 18 or older, or about 146.7M people in the U.S., which is nearly double the number of U.S. LinkedIn users. The large number of users combined with the ability to easily perform gender, race and ethnicity searches with Graph Search means that Facebook could be considered to be one of the most effective solutions for companies dedicated to diversity and inclusion.